Society Assumes Vegetable Garb for the Season's Last Big Dance -- Striking Costume Effects. The last of the season's big dances, a revivification of the days of Louis XVI, who is credited with having stood sponsor for similar entertainments at Versailles, took place in the form of a "plant party" at the home of Mr. and Mrs. Abram S. Hewitt, 9 Lexington Avenue, last night. It was attended by several hundred of the city's wealthiest and most fashionable people. As a novelty the plant party was a success. 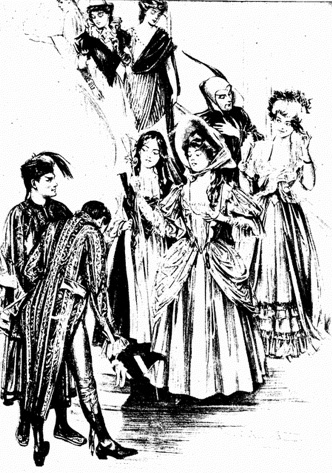 The edifying spectacle of richly costumed and bejeweled women carrying about on their persons imitations of various representatives of the vegetable kingdom, from squash and lettuce to meteor roses and orchids, and of men in conventional evening dress, with similar additions, was something enough out of the ordinary to interest the people concerned, and also plenty of others who were not favored with invitations. The women guests were asked to go in costumes representative of some particular fruit, flower, or vegetable. The men appeared at the house in ordinary evening dress, which prevented too close a similarity to the Versailles "plant parties," and as each of them entered he received a vegetable adornment, artificial of course, which he was supposed to wear for the rest of the evening. The feminine guests showed little tendency to clothes themselves in complete imitation of plants or fruits, but were contented with bizarre headdresses and vegetable garnitures, which were sufficiently startling without quite spoiling the effect of handsome gowns. One young woman carried in a staff adorned with garlands, and another had snowshoes carried in for her to complete her costume. Mrs. Hewitt received her guests in a costume suggestive of violets, and carried real specimens of the flower. The Misses Hewitt, who assisted her, carried pinks and orchids. Mrs. P. Cooper Hewitt daughter-in-law of the host, who was with them, wore imitation red carnations in her hair. P. Cooper Hewitt and Edward Cooper were among the other relatives present. The entertainment was of a vaudeville character and started abut 10:30 P.M. There were charades, tableaux, and songs, all furnished by the guests. Lander's Orchestra played, and supper was served about midnight. There was some informal dancing afterward, but no cotillion. G. Creighton Webb created considerable amusement by appearing in an admirable make-up of red hair and beard and complexion to match. He disguised his voice with good effect. The plant party is said to have been the first thing of its kind ever given here, though a vegetable party, in which men and women were both costumed, took place at Sherry's two years ago. It was a leap year dance, and was attended by a number of fashionable people. Among the striking costumes were those of Mrs. A. Cass Canfield, who wore a basket of roses as headgear; Mrs. Francis Key Pendleton, who was in yellow satin, trimmed with small sunflowers, and wore the head of a tremendous sunflower in her hair; Mrs. W. Bayard Cutting, in cerise velvet, and wearing as a bonnet the half of a flower pot from which a stalk bearing pink carnations protruded; Mrs. Nicholas Fish, a costume designed to represent wild field flowers; Mrs. Stanford White, in yellow satin, with poppies over her head and used to trim the corsage of her gown; Miss Edith WInthrop and Miss Ruth Morgan, gowned to represent poppies. Mrs. Victor Sorchan, in pink satin, trimmed with pink roses, and wearing a pink satin rose, which measured about eighteen inches across, on her head; Miss Kernochan, as a sunflower, with satin gown appropriately trimmed; Miss Mary Kernochan, a white satin gown covered with apple blossoms; Mrs. W. Stover Miller, in brilliant red tulle and wearing a Bacchante wreath of grapes and grape leaves in her hair.